1978 was a dark time for the performance automobile in North America. Real performance had given way to flashy stripes and vinyl tops, mandatory emissions equipment was suffocating engines and cars seemed to be getting heavier and more overwrought year by year. It's hard to believe now, in this era where 300 horsepower is common in a mid-price sedan that there was a time when hardly any cars made more than 200 horsepower. 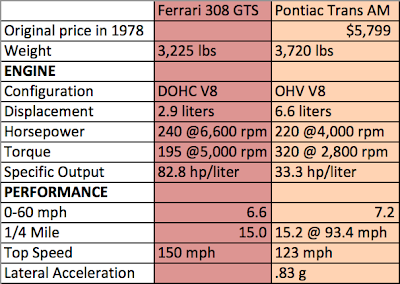 The Ferrari 308 and Pontiac Trans Am were two such cars that were plenty different but shared one large similarity. They were two of the best performance cars you could buy in 1978. 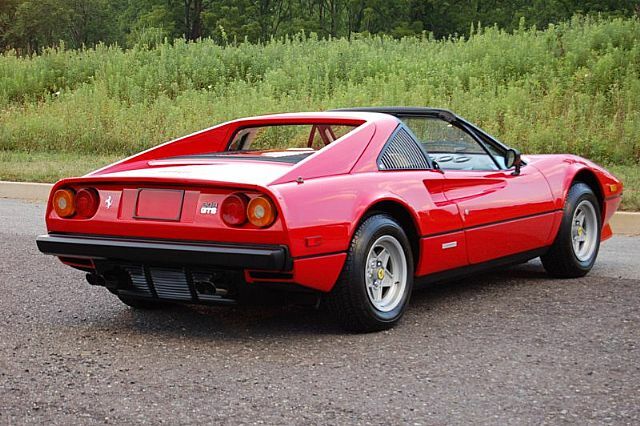 The Ferrari 308 (3.0 liters, 8 cylinders) was introduced in 1975 as the "entry level" Ferrari. Sporting swoopy and scoopy styling by Pininfrina, the 308 was a bold car in the Ferrari tradition. Backing up all those big looks was a tiny 2.9 liter (I know, I know) DOHC V8 mounted transversely behind the seats. Breathing through four snorting and popping two-barrel carbs it made 240 horsepower at a yowling 6,600 rpm. At first glance, it might seem like pitting a plow horse against a thoroughbred but the Trans Am was a force to be reckoned with in 1978. 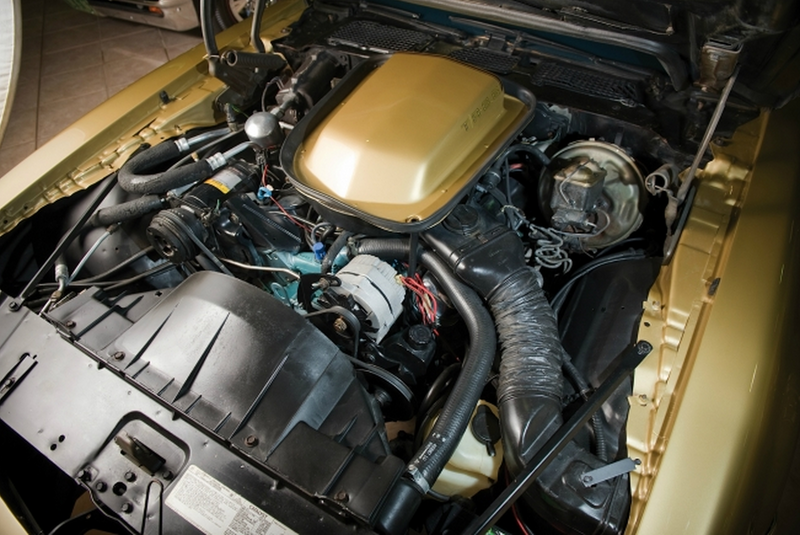 Soldiering on as the last bastion of true American performance, the '78 TA was once of the baddest muscle cars made since 1974. Bold, '6.6 LITRE' callouts signified that there was a heavy drinking 400 cubic inch V8 under the quivering "shaker" hood scoop. Higher compression, a meaner cam and extensive refining of the heads yielded 220 horsepower at a leisurely 4,500 rpm from the baby blue lump of iron. Now before you scoff, this is AMERICA dammit and that V8 put out a formidable 320 lb/ft of torque. So how do these cars line up in the real world? Does big displacement beat sophistication on the drag strip? Not quite, but considering the massive price gap between the two, it's fairly close. The Ferrari takes 6.6 seconds to reach 60 mph and can run the 1/4 mile in 15 seconds flat. The Pontiac is carrying an extra 495 pounds over the 308 and making do with 20 fewer horses, things don't look good for the Bandit. But big torque at an accessible 2,800 rpm plays it's part and the Trans Am roars to 60 mph in 7.2 seconds. In the quarter, it trails Ferrari by only two tenths of a second at 15.2 seconds. Top speed between these cars is a no contest as the Pontiac runs out of gearing at 123 mph while the Ferrari makes full use of its five-speed to achieve 150 mph. It's worth noting that top speed in the Trans Am was achieved 1,100 rpm past it's peak power rpm so who knows how fast a 6.6 liter Trans Am would go with longer gearing. Heading to the twisties in these two cars, things get interesting again. With such sterling heritage and a nearly 500 pound weight advantage over the TA, the 308 appears to have to have the upper hand. It certainly has the bones for success. The 308 uses a fully independent double wishbone set-up on each corner and the chassis is made of tubular steel. All this meets the road on 205 mm wide tires and contemporary reviews cite lateral acceleration in the range of .8 g.
The odds seem stacked against the Trans Am. The TA is based on a humble chassis and uses a stone age traditional live rear axle in the rear suspended by leaf springs. Despite many people's derogation of this setup, when ordered with the WS6 handling package, magazine reviewers raved about the car's balance and handling. Stiff springs and aggressive anti-roll bars were a part of the package and the Trans Am's signature "snowflake" wheels wore chunky 225 mm wide tires. All these upgrades culminated in an impressive .86 g of lateral acceleration. Take that Enzo! So where does all that information leave us? 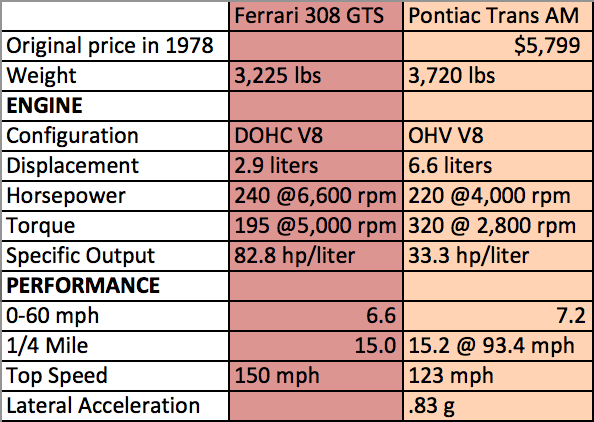 Well the Ferrari is the faster car but not nearly as much as it's higher price would lead you to believe. In most performance metrics, the cars are very close. 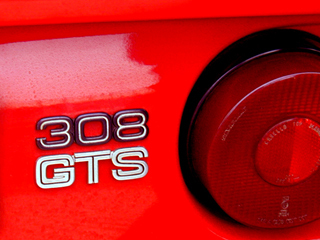 The 308 GTS and the Trans Am are two of the most iconic late '70's cars. Their build philosophies are polar opposites and yet they achieve the same goal; they both provide a well-rounded performance driving experience with real capabilities to back up their looks. And in 1978, that was a rare thing indeed. So all that said, which one would you pick? And what two car should we compare next? The ICE Age Begins Again!